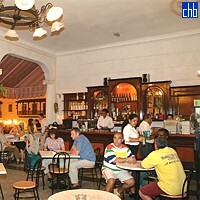 Bar hotela Casa Granda 1914 god. 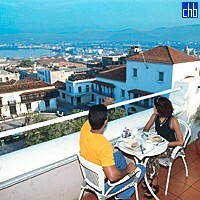 The visitor to Santiago de Cuba can admire the beautiful city from the luxurious, comfortable installations of the Hotel Casa Granda, restored to recover its original splendor. 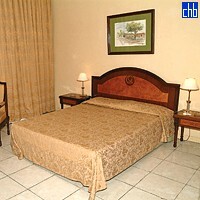 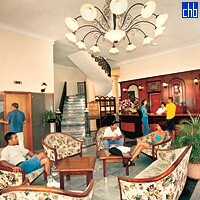 The Hotel is located right in the heart of the Caribbean city of Santiago, on a corner of the centrally located Parque Céspedes. 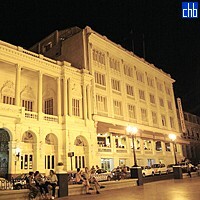 It is surrounded by the Metropolitan Cathedral, House of Poetry, Carnival Museum and the Museum of Cuban History, amongst other valuable buildings. 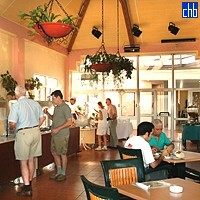 Guests at the Casa Granda enjoy a luxurious restaurant, specializing in Creole and international cuisine, a cozy terrace café-bar with views of the neighboring park, and a lookout point snack bar located in the Roof Garden on the top floor, with splendid views of the city, the mountains and the Caribbean.